My C2E2 weekend was an absolute blast, and I look forward to regaling you with stories throughout the week as I bring you titles that I picked up at the show. And today, I’m pleased to bring you a cool Image book drawn by Leila del Duca. I was on a panel with Leila on Friday, and she was so cool that she donated the books that she brought to the panel to my classroom library, one of them being Shutter. So as you might have figured, Volume One is strange, and it leaves a ton of unanswered questions, but damn if it ain’t one of the coolest, more captivating books I’ve read in a while. The volume is dense without ever feeling overwhelming. It’s characters are weird but not forced. The backstory is sparse but powerful. Leila del Duca’s art compliments the writing of Joe Keatinge in a way that feels seamless. Large panels populate much of the book to portray a scale that is needed to imagine the futuristic landscape. Flashbacks often have a slight fog to them, indicating the passage of time, separating them from the present. And other characters’ stories are often told in a different panel structure or slightly different lines: the art is still del Duca, but the changes are defined enough to vary the feel of the book. 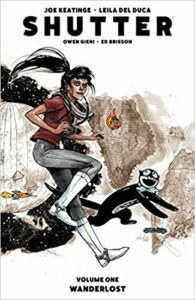 Shutter often feels like a collection of shorter pieces, put together to create a thrilling cohesive story that leaves me just confused enough to run out for volume two.